The short answer is that you have to do research and outbound telemarketing, and do it yourself. Learn more below. Reader Question: I have vacant retail space. I own an 8000 square foot retail building fronting on a street with a 15,000 daily car count. 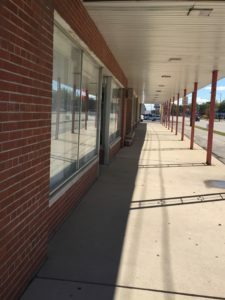 The building is brick and block with a retail glass front, and about 60 years old. The parking is adequate. Two tenants occupy the building. One pays about $14.00 per square foot (PSF), and one pays $11.00. 2500 square feet is vacant for over a year. Two different agents have come up empty-handed. I am concerned if I rent it for less than 14 dollars, the tenant will attempt to negotiate. What can I do to get this space rented and how can I deal with the 14 dollar tenant? Step 3. Re-evaluate your pricing. You did not mention offers, so I assume you had none. A year on the market with no activity could mean you and the agents have not priced it correctly. Make some secret shopper calls to your competitors to learn their pricing. Ask how long they’ve been looking for a tenant? Create a net cost to own sheet to email owner candidates. Step 4. Come up with a script and contact every property owner and tenant (include local business owners in high-rent buildings). The telephone is the fastest way to cover the field. If you are talking to a landlord, see if they want to acquire more property. If you are talking to a tenant, do they need more space or a smaller space? Have a data sheet prepared for rent- only candidates and email it to them. You are reversing real estate marketing by making outbound calls to generate leads.